This is a very comforting dish that my helper has made it to be. Though it is not very healthy, I enjoy having the various kinds of ingredients all coming together to make this dish so tasty! 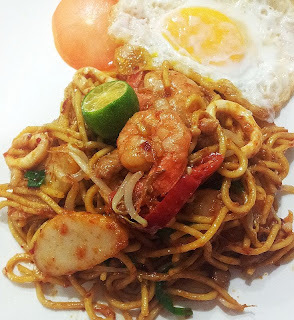 Basically, this is yellow noodles cooked with sambal belachan. I have the steps to make sambal belachan in this blog. So you basically fry this with minced garlic, onions, bean sprouts, prawns, squid, fishcake, noodles, spring onions (the top green ones) and sambal belachan. Then you can fry an egg as a side and sliced cucumber and tomatoes as well. It is very easy. Great dish for breakfast or lunch!